Greg LeMond (born June 26, 1961) is the only American to have won the Tour de France and is easily the most physically talented rider since Fausto Coppi. His VO2 Max of 92.5 remains one of the highest scores ever attained. LeMond was a complete rider. He could climb with the best, roll the big gear, and sprint. He was also one of the most skilled and daring descenders the sport has ever seen. Almost from the moment Greg LeMond first turned a bicycle pedal he began winning races, becoming America's dominant intermediate and then junior rider. LeMond was twice Junior American Road Champion and 1979 Junior World Road Champion. While still a junior he regularly raced against and beat senior men. He signed his first professional contract with Cyrille Guimard to ride for the Renault-Elf squad in 1981. LeMond ran into his big first controversy at the 1982 World Road Championships in Goodwood England. Fellow American John Boyer took a flyer near the end of the race. Before the sprint ramped up LeMond went after him, but Giuseppe Saronni was on song and no one was going to beat him that day (Sean Kelly said he couldn't even hold Saronni's wheel in the sprint). 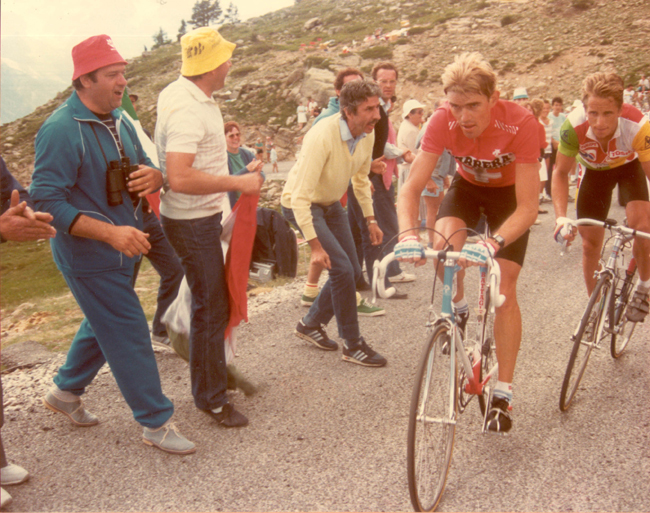 But Boyer was bitter, saying he would have won had LeMond not chased him down. LeMond, who came in second, insists the Americans did not ride the Worlds as a team. 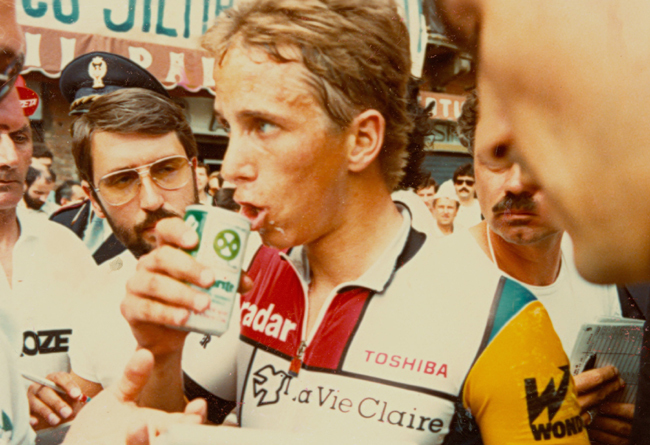 LeMond, like the other Americans at the race, paid his own own expenses and rode for himself. A review of the race shows Boyer had no chance of staying away. 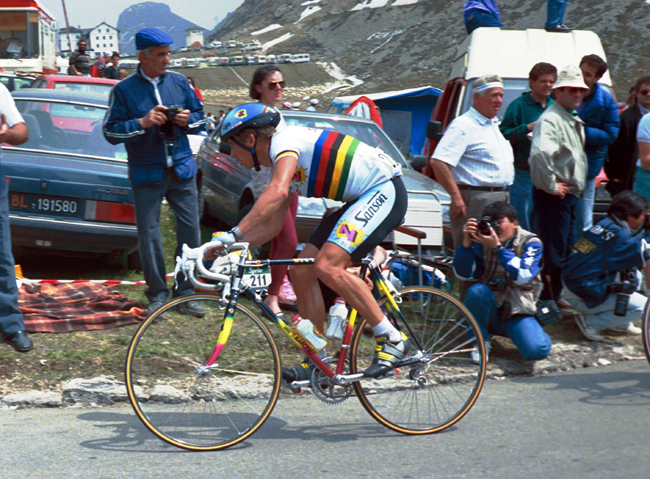 The next year LeMond won the first of his two rainbow jerseys with a perfectly timed breakaway. That he had a talent for stage racing showed when LeMond rode his first Tour de France in 1984 in support of Laurent Fignon. Despite his domestique duties, he came in third and won the best young rider's white jersey. LeMond switched teams in 1985, riding with Bernard Hinault for Bernard Tapie's La Vie Claire squad. That meant he was still second banana, this time to Hinault. Hinault crashed part way through the Tour was was dropped in stage 17. While Hinault was being left behind, LeMond was away with Stephen Roche. In a still really unexplained episode, LeMond was told to wait for Hinault, who was said to be less than a minute back. 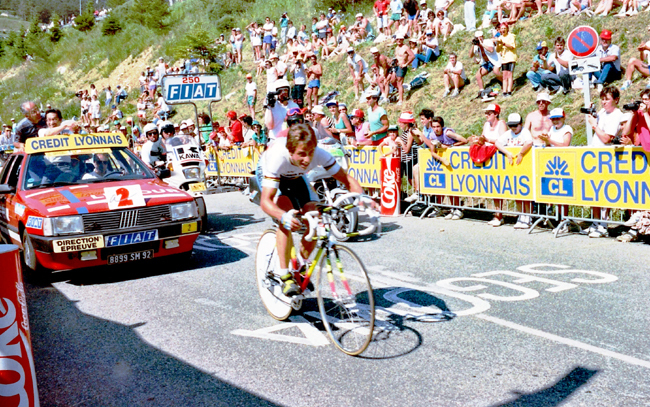 In fact, Hinault was several minutes behind and never caught the LeMond group. After LeMond had made the sacrifice of a lifetime and allowed Hinault to win his fifth Tour Hinault promised to help LeMond win the Tour in 1986. That didn't happen. Between LeMond's bad luck, his flat-footed tactical awareness and Hinault's constant attacks, LeMond's 1986 Tour was was one of racing's most exciting ever. 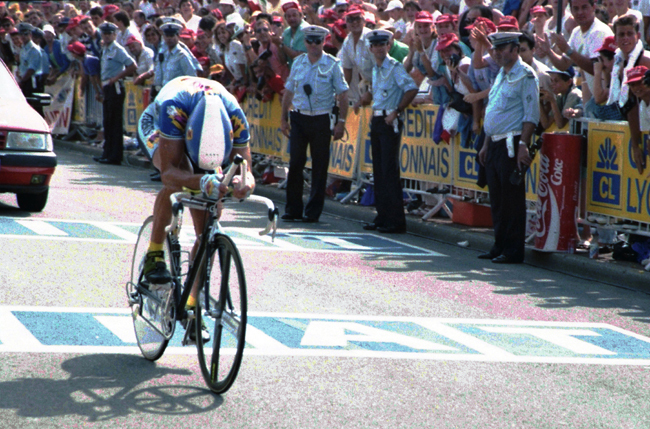 LeMond's physical superiority finally won out, but beating Hinault was no easy thing. LeMond was badly wounded in a hunting accident in the spring of 1987. The near-fatal accidental shotgun blast left LeMond unable to compete at a high level until 1989. In fact, LeMond was never the same rider again. The first hint that his comeback might be successful was his second place in the final time trial of the 1989 Giro d'Italia. That ride astounded two-time Tour and 1989 Giro winner Laurent Fignon and his manager Guimard. 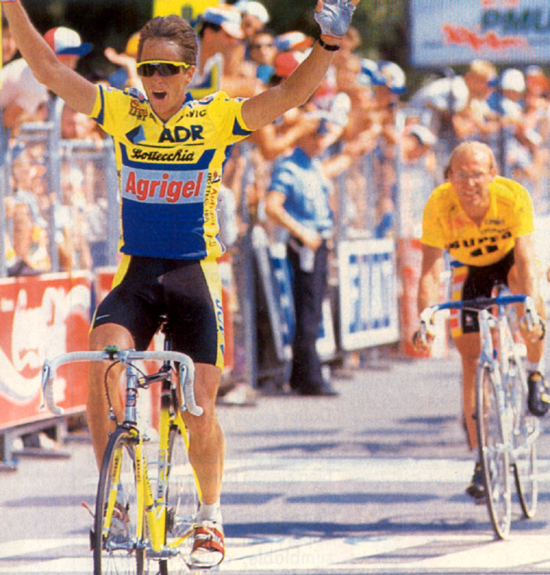 Unlike almost everyone else, LeMond included, Guimard expected LeMond to be a serious challenger in the Tour. Guimard was right. In the 1989 Tour Fignon and LeMond brawled day after day. They were almost identical in ability, Fignon a slightly better climber, LeMond the superior time trialist. 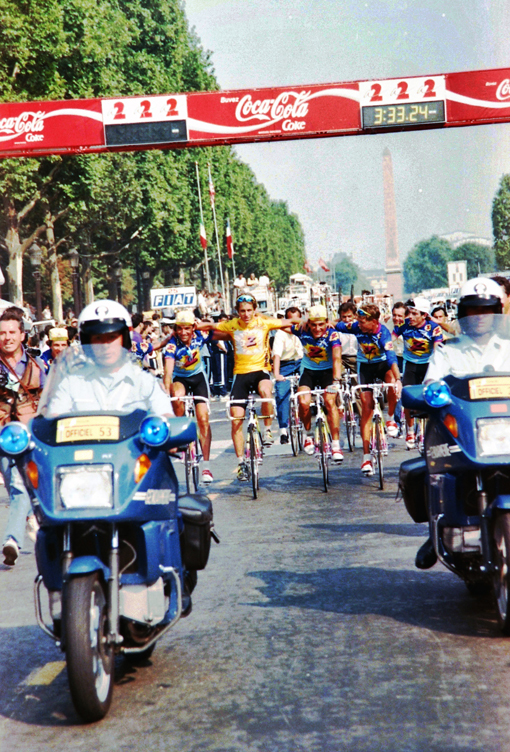 Going into the final stage, a 24.5 km time trial into Paris, Fignon had a 50 second lead. LeMond thumped a giant gear to win the stage and the 1989 Tour. His eight-second overall winning margin remains the closest in Tour history. LeMond went on to win his second World Pro Road Championship at the end of the 1989 season. 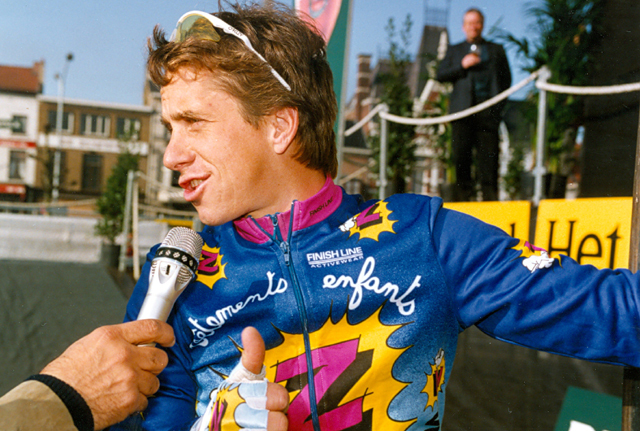 For the first time in his career, in 1990 LeMond rode for a first-class team, Z, that would give him complete support. Despite letting a break with Claudio Chiappucci scoot away with a nine and a half minute margin, LeMond won his third Tour. The world was turned upside down in 1991. EPO had populated the peloton and LeMond went from being one of cycling's dominating riders to one who was consistently shelled on the big climbs. LeMond also said that he was unable to ride as well as he had before, blaming the after-affects of his hunting accident. LeMond raced until 1994, but never again found the old sparkle. LeMond started an eponymous bike company, but it suffered from mismanagement and financial problems. The firm was shuttered and LeMond licensed his name to Trek. When LeMond, long an anti-doping advocate, expressed the mildest of doubts regarding Lance Armstrong's Tour de France success, he received the full force of the Armstrong-Industrial complex. LeMond was harassed and threatened into issuing an apology. 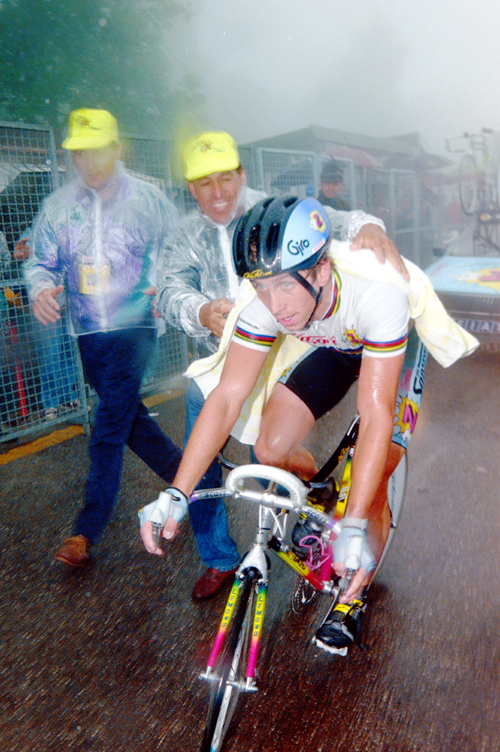 It was a dark day for LeMond and a dark day for cycling. We now know LeMond was right. With both Armstrong and Floyd Landis stripped of their Tour de France titles, Greg LeMond remains the only American to have won the Tour de France. He is the greatest American rider of cycling's modern age. 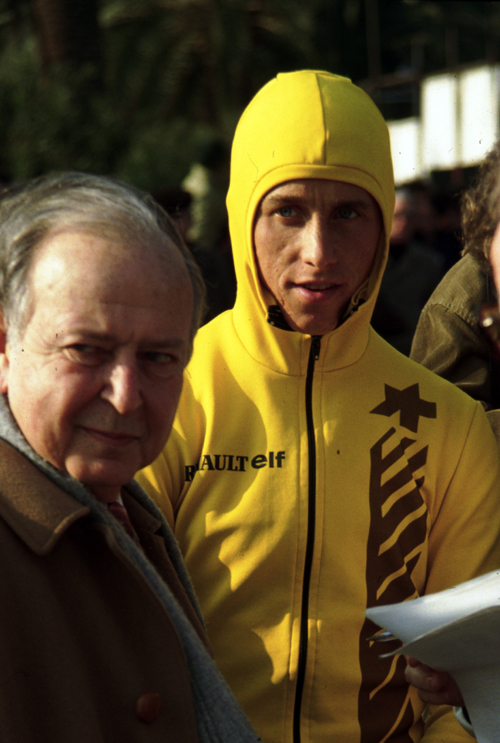 LeMond dressed warmly at the 1982 Giro di Lombardia. 1984 Tour de France, stage 15. 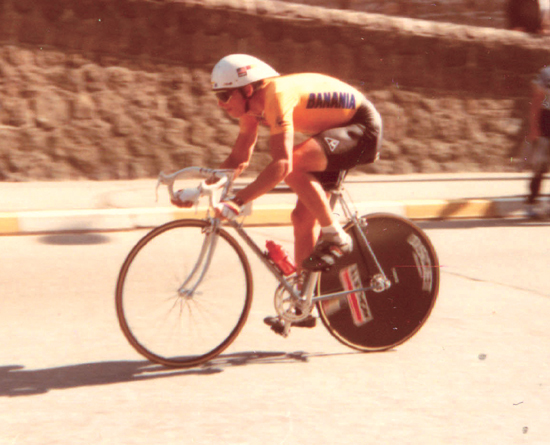 LeMond rides the 22-kilometer time trial to La Ruchere. 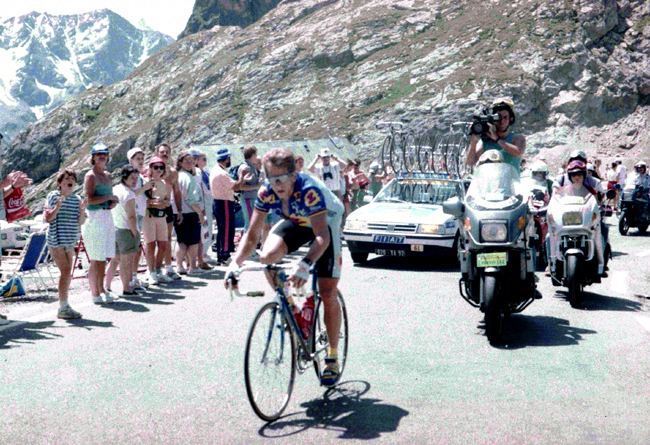 1984 Tour de France, stage 16, Grenoble - l'Alpe d'Huez: LeMond is probably on l'Alpe d'Huez. He came in sixth, 3 minutes 30 seconds behind stage winner Luis Herrera. 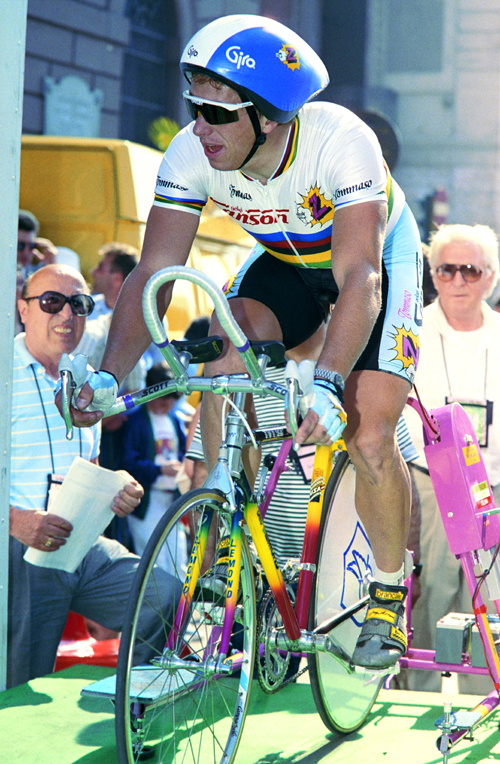 LeMond at the 1984 World Championship Road Race in Barcelona. LeMond after stage 12 of the 1986 Giro d'Italia. 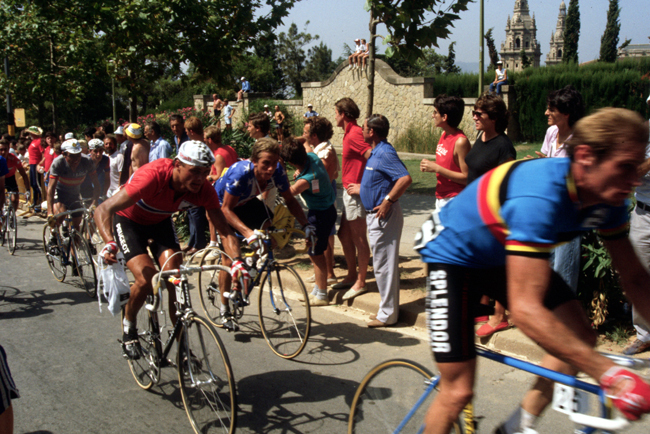 Urs Zimmermann leads LeMond in stage 16 of the 1986 Tour de France. LeMond (in yellow) and Bernard Hinault finish together at the top of l'Alpe d'Huez in stage 17 of the 1986 Tour de France. 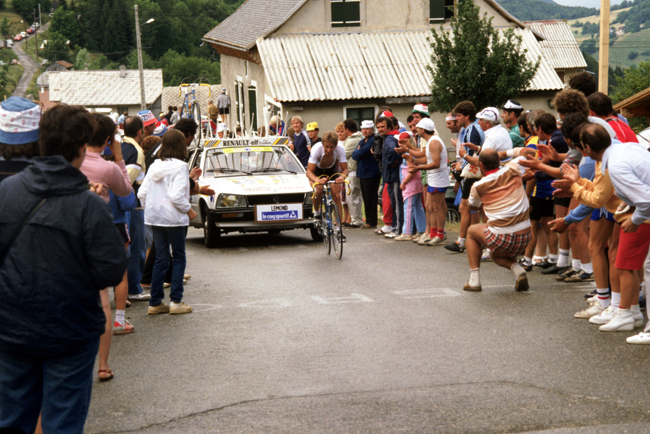 LeMond in stage 19 of the 1986 Tour de France. 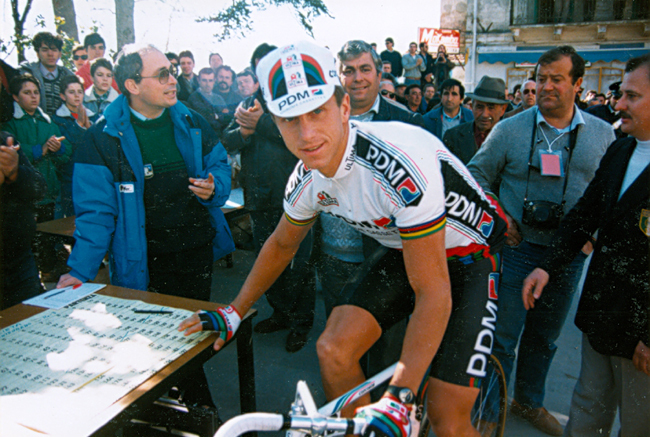 At the start of the 1988 Milano-San Remo. 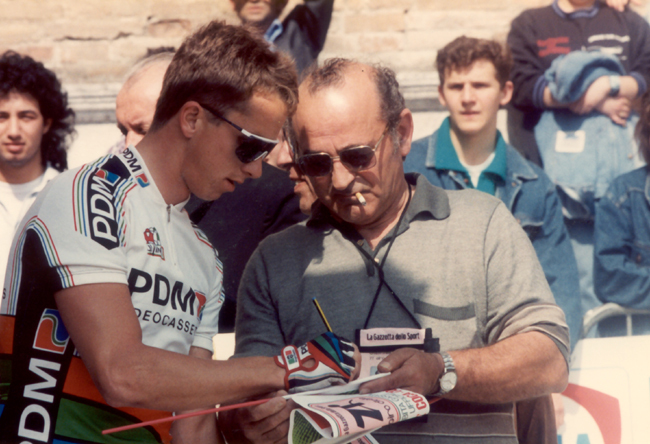 LeMond signs in for stage 4 of the 1988 Tirreno-Adriatico. 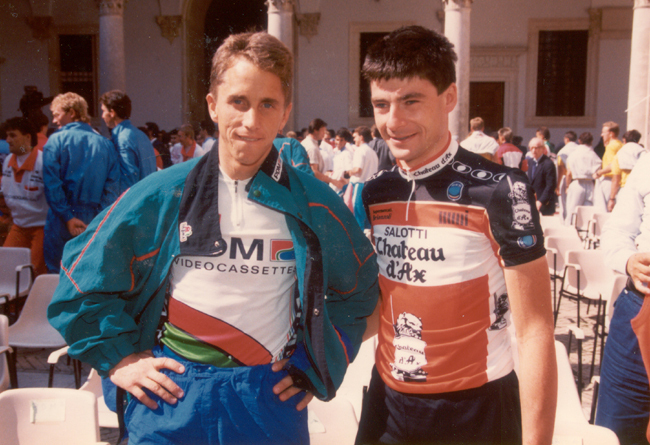 LeMond with Gianni Bugno at the teams presentation of the 1988 Giro d'Italia. LeMond at stage two of the 1988 Giro d'Italia. LeMond time trials in stage 4 of the 1989 Tour de France. 1989 Tour, stage 19: Lemond beats Laurent Fignon. 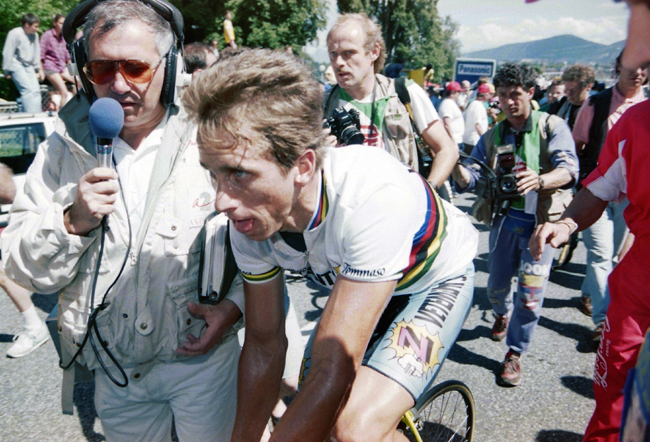 Chambery France: Greg LeMond wins the 1989 World Road Cycling Championships. 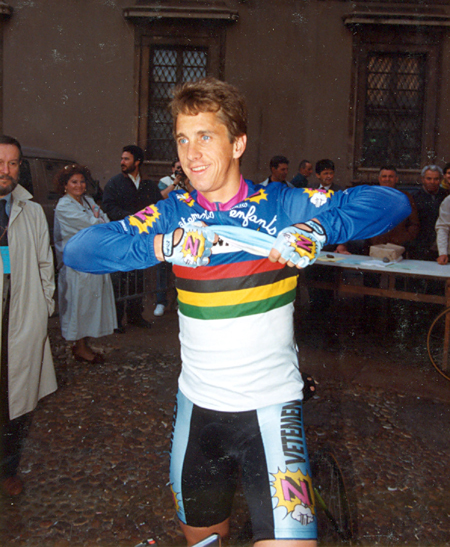 LeMond gets ready to race at the start of the 1990 Milano-San Remo. 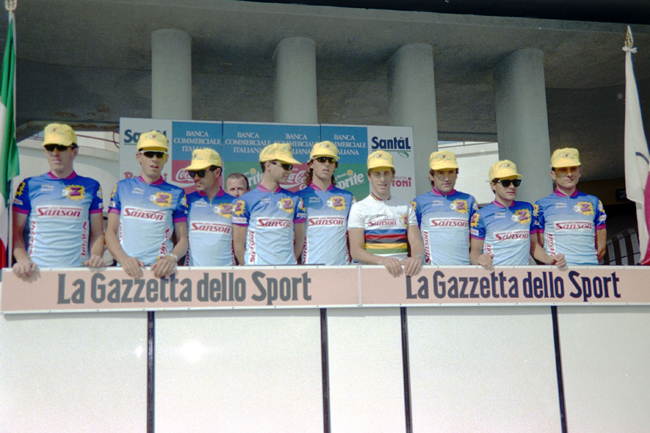 LeMond's Z team presented at the 1990 Giro d'Italia. LeMond is ready to ride the stage 1 time trial at Bari in the 1990 Giro d'Italia. 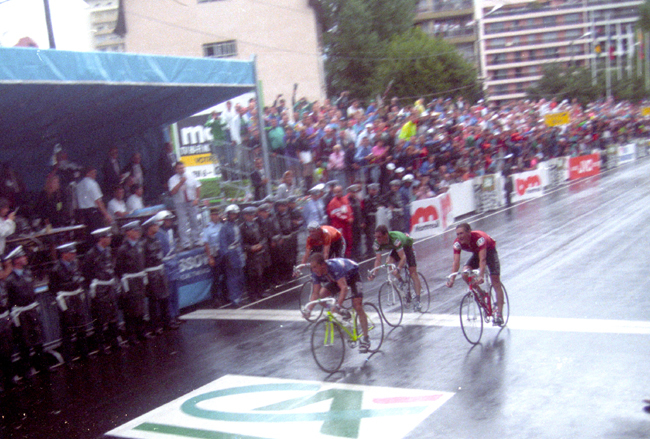 LeMond at the start of stage 2 of the 1990 Giro. LeMond on the Pordoi in stage 16 of the 1990 Giro d'Italia. 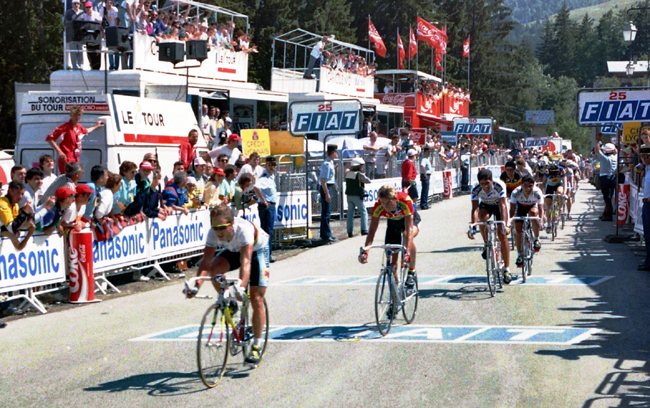 LeMond finishes stage 19 of the 1990 Giro at Sacro Monte. 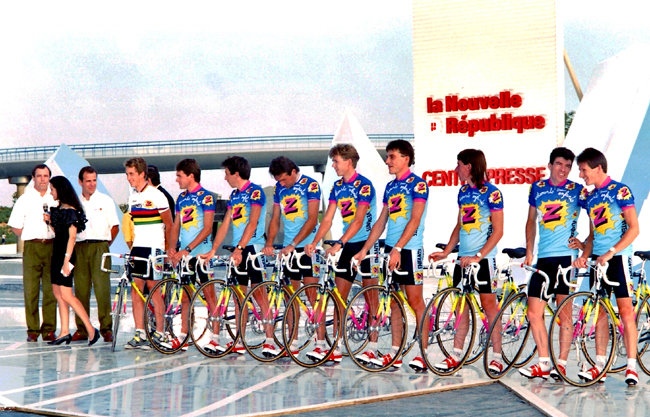 1990 Tour de France presentation of LeMond's Z team. 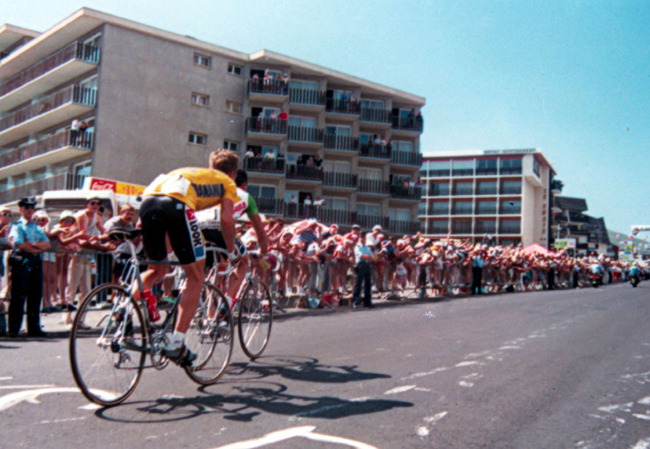 1990 Tour de France, stage 8: LeMond finishes in Besançon. At this point he's seventh in GC. 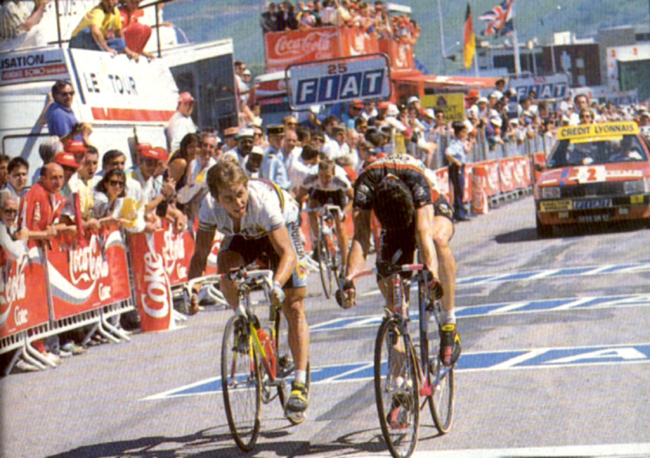 1990 Tour de France, stage 10: LeMond finishes 10th at Mont Blanc. 1990 Tour de France, stage 11: Gianni Bugno just beats LeMond at the top of l'Alpe-d'Huez. 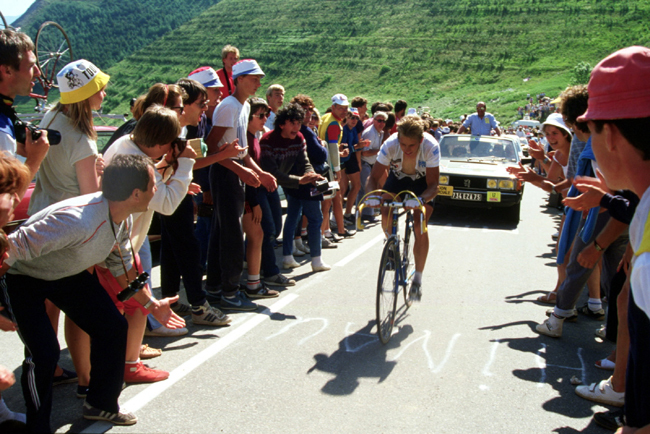 1990 Tour de France stage 12: LeMond rides the 33.5 kilometer time trial to Villard de Lans. 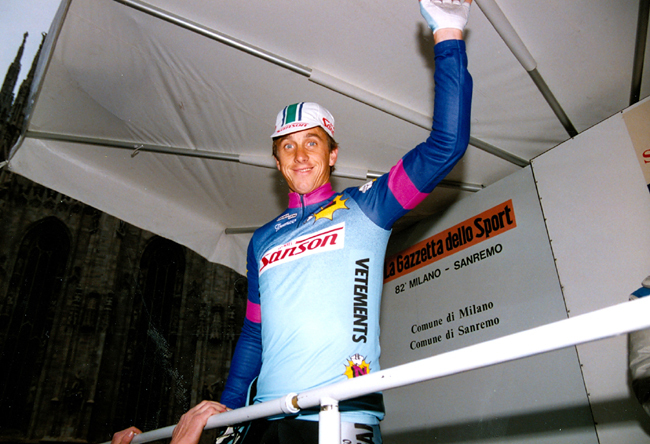 Claudio Chiappucci took the lead after this stage. 1990 Tour de France, Paris: Greg LeMond has won his third Tour. 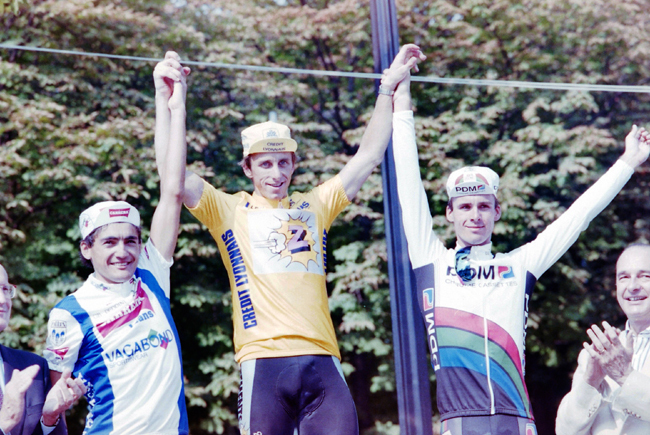 1990 Tour de France final podium, from left: Claudio Chiappucci, Greg LeMond and Erik Breukink. 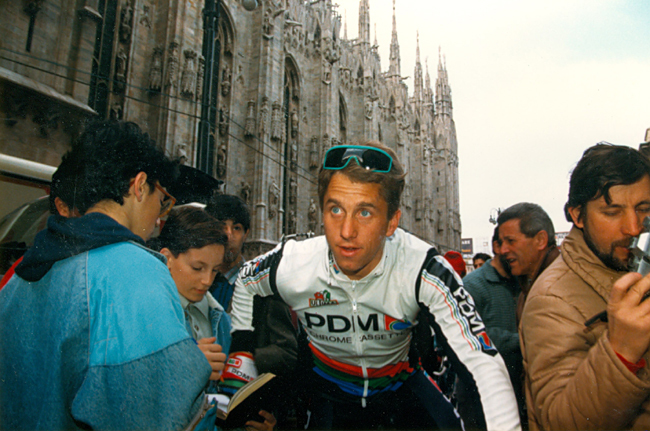 LeMond at the start of the 1991 Milano-San Remo. 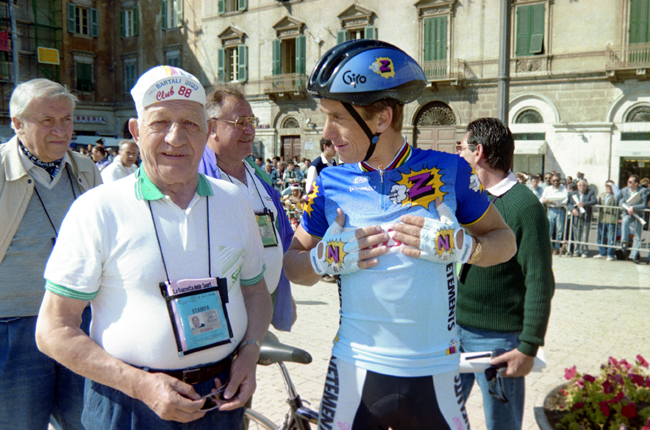 Gino Bartali and Greg LeMond at the start of stage 3 of the 1991 Giro d'Italia. 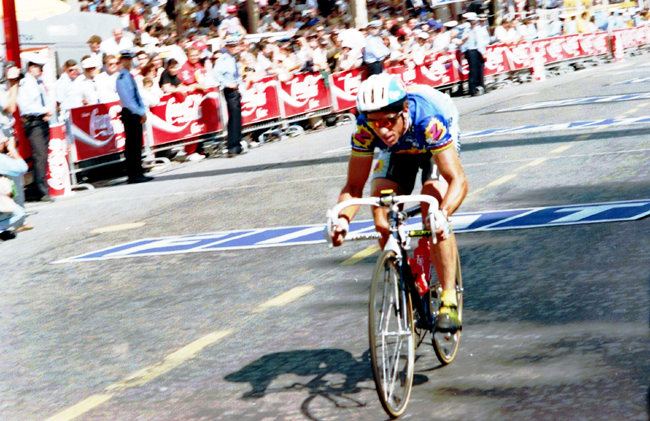 LeMond rides the prologue of the 1991 Tour de France. 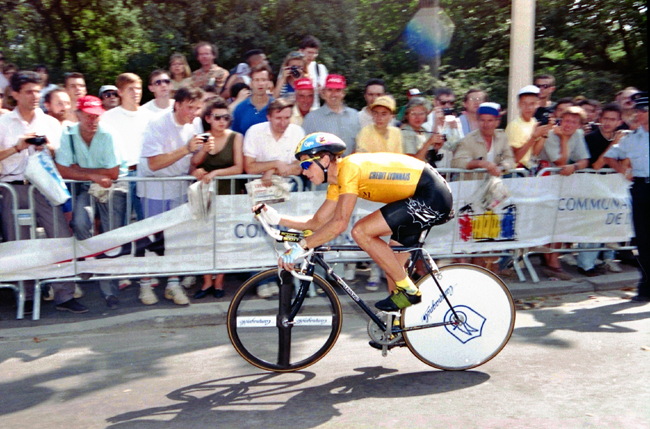 LeMond drives his bike in the 1991 Tour de France stage 21 time trial. 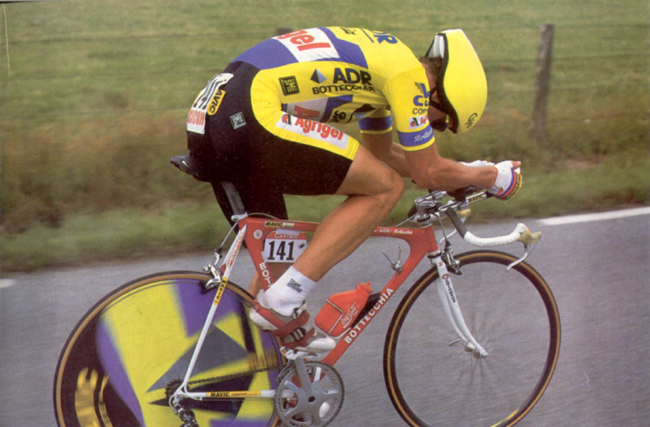 LeMond gives it a go in the final stage of the 1991 Tour. 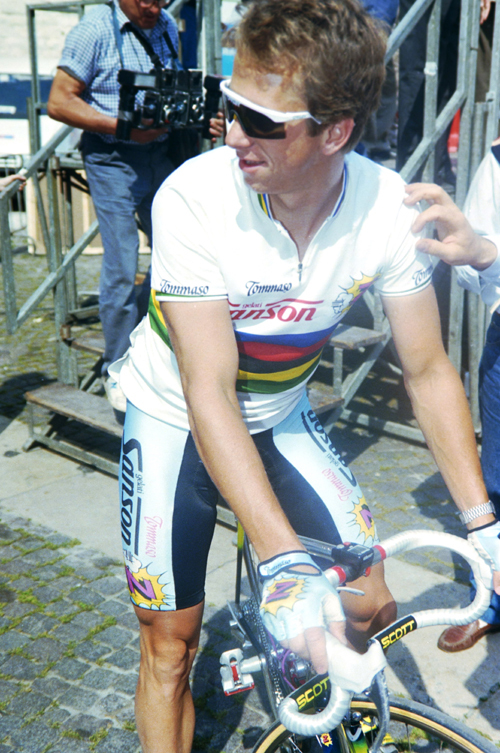 Greg LeMond at the start of the 1992 Tour of Flanders. LeMond in stage 14 (Sestriere-l'Alpe d'Huez) of the 1992 Tour de France. 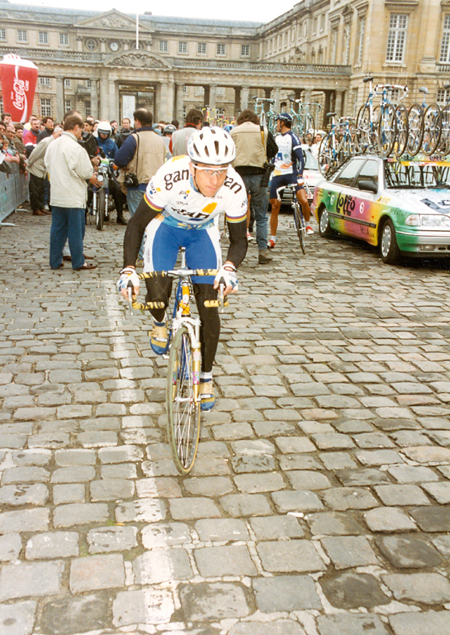 LeMond at the start of the 1993 Paris-Roubaix. 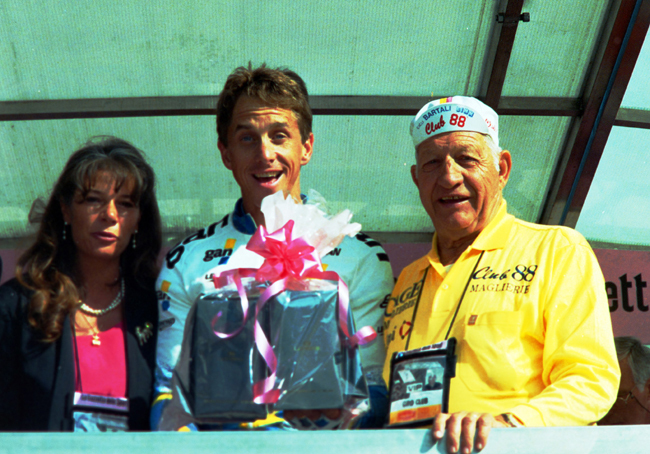 LeMond with Gino Bartali after stage 14 of the 1993 Giro d'Italia. 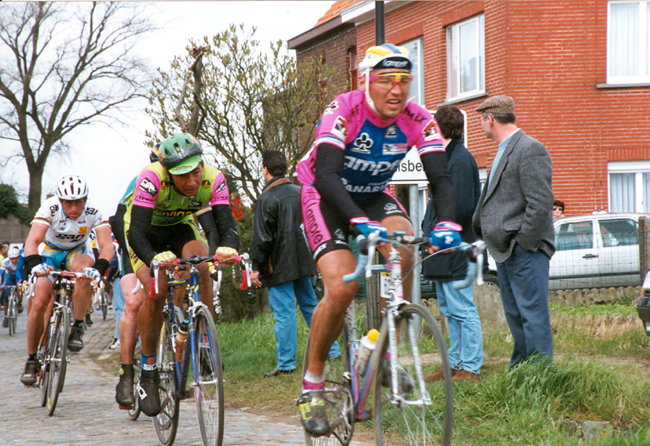 LeMond (white Gan jersey) at the 1994 Tour of Flanders. 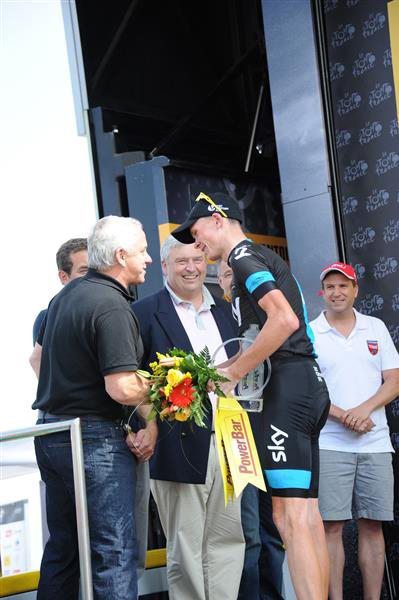 LeMond (black polo shirt) at stage 15 of the 2013 Tour de France, talking to Chris Froome.